The ideological and physical implementation of borders has become a key debate surrounding the global refugee crisis. In the past decade, forty-thousand people died trying to cross international borders, with deaths along the shores of Europe only accounting for half of these. At the same time, military-industrial complexes have expanded to further secure and police border zones across the world. The relationship between conflict along borders, security and militarised projects, and the refugee crisis prompts ever more relevant discussion. I recently went to a talk called ‘Violent Borders: Border Conflict, Security and the Refugee Crisis’ at the Frontline Club in London’s Paddington. This was opened with a presentation by Dr Reece Jones, Professor of Geography at the University of Hawaii and author of a major new analysis of the refugee crisis focusing on how borders are constructed and policed: Border Walls: Security and the War on Terror in the United States, India, and Israel. Jones was joined by a panel including Professor Heaven Crawley who leads research on migration and human security at the Centre for Trust, Peace and Social Relations at Coventry University, Elinor Raikes, Regional Representative for the International Rescue Committee’s (IRC) response to the European refugee crisis, and Richard Savage, Global Emergency Response Security Manager for Save the Children. Collectively, the speakers agreed that in order for the lay public as a general media audience to best apprehend the refugee crisis, it is necessary to dilute the counter-narratives that are consistently published across print and online media, instead prioritising meaningful stories directly reported through contact with migrants and refugees. 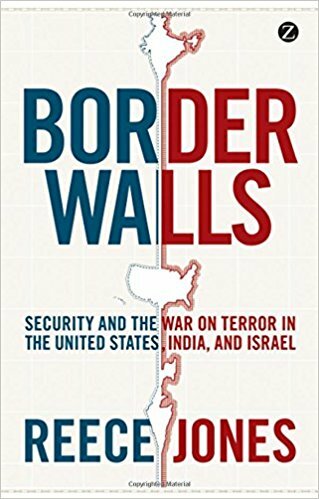 This is especially the case when considering borders or walls which are used to enact political narratives of ‘violence at borders’ positioned in terms of terrorist or violent threats to deter movement at these fringe lands. Of course, this lexicon of ‘movement’ is self-stultifying and serves again to challenge the rhetoric of existent media narratives around the refugee crisis. In the context of the supposed ‘moving wall’ of refugees closest to home, that of the European refugee crisis, a personal reminder of the necessity of this challenge comes from a close friend currently working as camp manager at Lighthouse Relief on the Greek Island of Lesbos supporting those that land on its shoreline. Such support varies from hard labour managing clean-up operations to helping source legal guidance on their rights around seeking asylum, particularly in instances where these are unclear. The frenzied tension of her email messages relayed from this literal frontline highlight her desire for ‘the top to be blown off’ the conditions of the detention camp on Lesbos where newly landed refugees must report and be effectively walled-in until their release at a point when a return, a stasis or forward drive has been decided for them. Of the many reporters and journalists that have also arrived on Lesbos’ shores via very different means, with decreasing frequency, little of the actual narratives make it into print. As such, discussions such as those at the Frontline Club offer an essential arena in which to augment the alternative reality of the crisis, unbounded by the walls of mainstream media. During the panel discussion, Jones drew on statistics from his book, highlighting the temporal shift in number of borders since 1944. At the end of World War II, there were less than 5 border walls around the world; today there are about 780. With such a proliferation comes a whole wave of new and growing security practice at such sites. Jones’ writing suggests that there must be an active awareness of this proliferation amongst key stakeholders and media. Further, that they – and we – must respond to it. There must be a more transparent drawing of the relation between the hardening of borders and increased deaths at these sites and national acknowledgement that the model and practice of wall building as ‘deterrants’ does not, in reality, mean that fewer migrants are coming to these borderlands but instead that more are dying. From my own reading and understanding, there is a need to tell individual stories. For many who encounter and counter borders, the prospect of crossing them is far less grave than staying where they are. Of course, this differs based on whether those persons are migrants or refugees but this only goes to reflect that border people are not a homogenous body but have different motivations, hopes and narratives to tell. There must be an urgency to this telling as the militarisation of border controls and funnelling of people on the move to more dangerous crossing points is leading to increased brutality and oppression of these live narratives. Raikes, who has worked in Greece and across programming in Germany focused on the chaos of social disruption and displacement across the Aegean and Mediterranean seas, describing the ripple effect caused by border closures. Crawley broadened this discussion, identifying the very different demographics of those moving via the Central Mediterranean (Syria to Italy) and Eastern routes (Turkey) and reiterated the need for higher profiling of refugee narratives to better understand the backstories of how persons come to ‘be’ at these places (both geographically and in terms of social situation and context). Undeniably, there’s a complexity about ‘who’s on the move’ with associated considerations of ‘how’, ‘where to’ and, fundamentally: ‘why?’. These interrogations aren’t asked solely out of a desire to report on circumstance, but so too to function a more viable and effective interface between reality and policy. Current policy responses are dysfunctional and show gross disparity between what we know about the reasons for peoples’ movements and the response. And this debate is at once everything about refugees and nothing about refugees. The ‘crisis’ becomes a lens through which country politicians communicate with their citizens via a Trump-esque populist nationalism. This perception becomes a reality, seeping down into local level understanding of the crisis and impacting refugee ‘acceptance’, which is inevitably clouded by fear of the stories that aren’t being shared by their nation’s government and media. So, aside from continuing these discussions and recognising that they are not centred on Europe but apply worldwide, not least the Mexico/US border, there must be a stretch for solutions. Albeit hypothetical, ‘open borders’ is an imperfect but hopeful option. Opponents of ‘open borders’ often don’t recognise that movement of peoples is often temporary and assume that ‘open’ means undocumented and unmoderated. In fact, very few people want to ‘move’ in this sense. Globally, only 3% of the world’s citizens reside outside of the country in which they were born, including those who have actively elected to do so. Furthermore, global circulatory movement across groups is actually pretty high, with many persons who move countries for a job or a lifestyle change, for instance, ultimately returning to their root nation with forcibly displaced persons often returning to their home nation once a state of peace is to be viewed with hopeful permanence. We need to look at responses much further ahead while continuing to steadily challenge the desensitisation to the crisis of policy makers, UN member state stakeholders and also of the persons making the tracks who are increasingly taking greater risks that suggest a desensitisation to the barriers and dangers that lie in their way. The changes wrought by the impact of climate change, the militarisation of civilian populations and mainstream media’s adoption of the ‘middle road to nowhere’ will only cause even more movement. With this, comes more narratives to be exposed, told, heard and addressed. Great article! Makes me want to get involved and help out!